Netflix for Apple TV by Netflix, Inc.
Netflix is the leading streaming service that lets you watch a ton of TV shows and movies. The best. 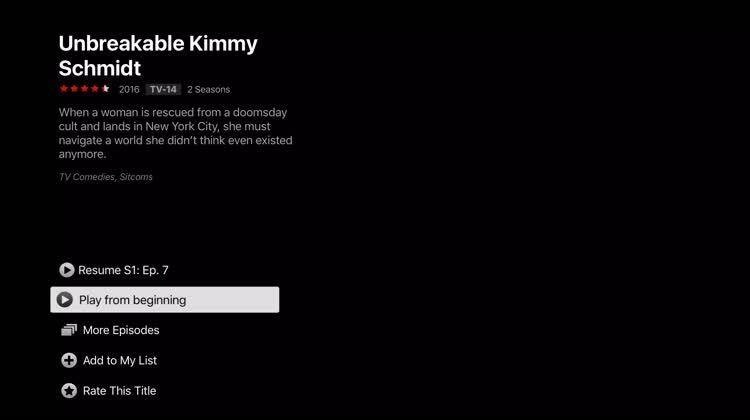 The most popular video streaming service on the planet features original programming and films, including "House of Cards," "Unbreakable Kimmy Schmidt," and "Making a Murderer." Requires a monthly subscription. Everyone has heard of Netflix — it's the leading Internet streaming service for most of the hot shows and movies that you can't miss. A subscription for streaming starts at just $7.99 a month, with some pricier options if you have a 4K television and want higher quality streams. You can even go above that and get the DVD/Blu-Ray rental too, but it's optional. Netflix streaming has a lot of popular shows as well as original series that are worth watching. Plus, you can always find a decent movie to watch when it's movie night. You are tired of hearing "Netflix and Chill"